There are two major subsystems in a cognitive radio; a cognitive unit that makes decisions based on various inputs and a flexible SDR unit whose operating software provides a range of possible operating modes. A separate spectrum sensing subsystem is also often included in the architectural a cognitive radio to measure the signal environment to determine the presence of other services or users. It is important to note that these subsystems do not necessarily define a single piece of equipment, but may instead incorporate components that are spread across an entire network. As a result, cognitive radio is often referred to as a cognitive radio system or a cognitive network. The cognitive unit is further separated into two parts as shown in the block diagram below. The first labeled the “cognitive engine” tries to find a solution or optimize a performance goal based on inputs received defining the radio’s current internal state and operating environment. 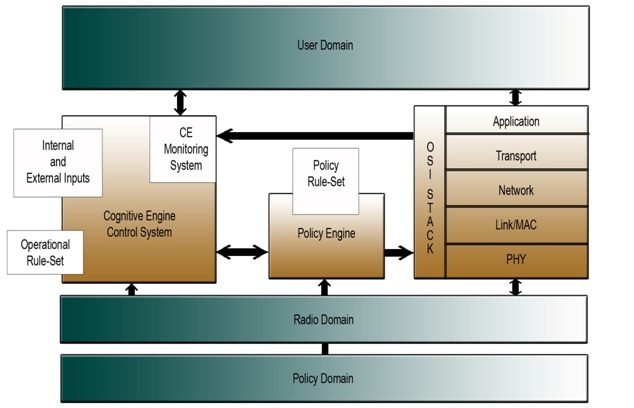 The second engine is the “policy engine” and is used to ensure that the solution provided by the “cognitive engine” is in compliance with regulatory rules and other policies external to the radio.